Well, we�re sitting here on Tilloo watching the Super Bowl on an Internet feed.� A couple of years ago we didn�t even have electricity, and now we have wireless internet and can get �live� video.� Also, my daughter, Lisa, and her husband, Marc, arrived here yesterday for a two week visit. A few days ago we visited Hope Town, on Elbow Cay�just north of Tilloo.� The dominant landmark in Hope Town is the red and white striped lighthouse. Hope Town's lighthouse must be one of the most photographed and visited in the world. 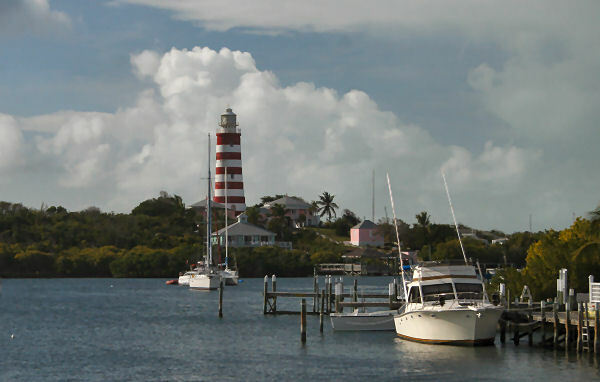 In addition to its distinctive candy-striped exterior, it remains one of the few manually operated, kerosene-powered lighthouses still in use, one of two in the Bahamas. A double shift of keepers share the duty of running up and down stairs every few hours around the clock to hand-crank the light mechanism, a formidable task given the one hundred steps up the steep, narrow stairwell. Visitors are welcome to explore the premises, climbing to a magnificent view across the Abaco Triangle of islands. For the intrepid, there's even an outer balcony, reached via a small, low crawlspace.